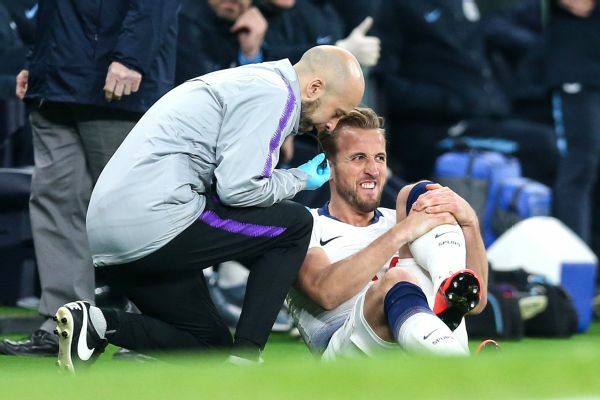 Tottenham Hotspur's Champions League title hopes took a hit when Harry Kane exited their quarterfinal match against Manchester City with a right ankle injury. Kane's injury comes at an inopportune time as Spurs also remain in the hunt for securing a top-four spot in the Premier League. "It's very, very sad. It's going to be tough and we're going to miss him -- maybe for the rest of the season," Spurs manager Mauricio Pochettino told BT Sport at the end of Monday's match. Lucas Moura came in for Kane. Son Heung-Min's 78th-minute goal ensured a 1-0 home victory for Spurs in the first leg. "It is a worry for us. We hope it is not a big issue. But there is not too much time to recover. He twisted his ankle so we will see how it reacts," Pochettino said. The injury occurred when City defender Fabian Delph stepped on Kane's foot on a challenge in the 58th minute. Kane's ankle twisted as he slid to the ground, and he later limped off the pitch toward the tunnel with the assistance of team trainers. "He was so aggressive with Harry after the action," Pochettino said. "I tried to explain to him that it wasn't the intention of Harry or him to damage each other, it was a tough action, and Harry twisted his ankle. "I said to Delph, 'You were lucky,' because they were checking the VAR and technically it could have been a red card. But I think both were fighting for the ball."